EPA 32 MPG Hwy/23 MPG City! CARFAX 1-Owner, GREAT MILES 8,337! CD Player, iPod/MP3 Input, Onboard Communications System, Brake Actuated Limited Slip Differential, Smart Device Integration, Alloy Wheels, WHEELS: 17 ALLOY SPARKLE SILVER PAIN... Turbo, Satellite Radio AND MORE! WHEELS: 17 ALLOY SPARKLE SILVER PAINTED ALLOY (STD). Ford SE with Ruby Red Metallic Tinted Clearcoat exterior and Medium Light Stone interior features a 4 Cylinder Engine with 178 HP at 5700 RPM*. 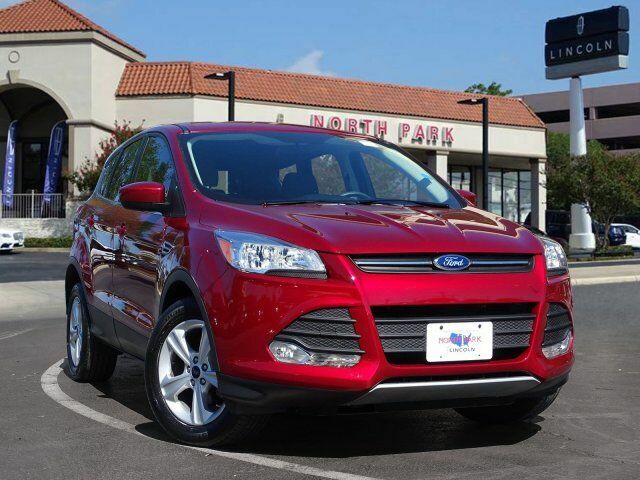 With its quick, precise steering and relatively sharp reflexes, the 2016 Ford Escape is one of the segment`s top athletes. Some compact crossovers feel tall and bulky from the driver seat, but the Escape just feels like a sporty hatchback with a higher center of gravity. -Edmunds.com. Great Gas Mileage: 32 MPG Hwy.